Jeremiah has just finished declaring that God is “uncompromisingly righteous and rigidly just” (Jer 12:1 AMP) – yet here he is bringing some strange questions to God that reveal his limited understanding. Why are those who do wicked things so happy? How long will the land mourn and wither? These questions reveal much about what Jeremiah understands of God. They present a truly perplexing problem to those who are under the impression that God rules the earth and everything that happens comes from Him. This teaching is called “Sovereignty of God” and is a staple of Calvinism. Asaph had this same misunderstanding in Psalm 73:2-17. When God is understood as an exerciser of blessing and grace to a people who He has endowed with Free Will – then the answers to these questions are easy. Satan is the god of this world’s system, the prince of the power of the air, the spirit that works in the children of disobedience (2 Cor 4:4, Eph 2:1-3, Rev 12:9). Many times he helps the wicked to prosper and hinders the righteous who have not yet learned to seek and get the help of God in their financial situation/business. Therefore, if a wicked man prospers the Christian should not stumble over that fact. They (the Christian) can prosper more than the wicked if they will be led of God and appropriate the promises to his own life. This is because the wicked (those who reject God’s rule over their lives) enjoy being wicked and gaining through ungodly means. They are as their name suggests. The land is mourning and the grass is withering due to being plundered and destroyed by the wicked. Again, the prophet assumes that God somehow sitting back and letting that happen. In actuality, it is happening due to the disobedience of God’s people (Judah) which has circumvented the Blessing of protection over the land. All of creation is groaning, waiting for that curse to be lifted (Rom 8:20-22). In 722 B.C. the aggressive Assyrians invade the northern kingdom of Israel and conquer her, forcing many of her citizens into slavery and basically destroying the kingdom. But the southern portion (Judah) was basically left alone as Assyria’s attention turned to more important threats elsewhere. So Judah was left to continue on as a small kingdom for the next 140 years or so. One would think that the warnings sent to Israel about the coming destruction (in response to their disobedience and sinful lifestyle) would motivate the Judahites to turn back to God and repent in an effort to avoid the same fate as her northern sister. Unfortunately, this was not the case. It is within this span of 140 years that the prophet Jeremiah comes on the scene. Born in the village of Anathoth, north of Jerusalem (Jer 1:1), Jeremiah was the son of Hilkiah, a priest. He grew up and began his prophetic ministry in the “thirteenth year of Josiah” (1:2). (If you remember, Josiah was the young king who would find a copy of the book of Deuteronomy in the Temple and usher in a great reform through Judah in 2 Kings 22ff). So Jeremiah began traveling throughout the countryside proclaiming the unfortunate future of the nation and warning the people to repentance while Josiah was attempting to reform the wayward people from his throne. In the end Josiah’s efforts fail and the nation plunges further into rebellion and sin. The entire span of Jeremiah’s ministry is 40 years, through the Babylonian invasion and destruction of Judah in 586 B.C. Jeremiah would eventually be part of a Jewish group that flees into Egypt – where he will live out his days. You can hear God’s heart come out in this opening section of the chapter. It is almost as if He is begging Jeremiah to locate just one as an excuse for Him to save them. Sadly, in the next few verses the Prophet reveals the outcome of that search; “they refused correction” (vs 3), “they refused to repent” (vs 4). 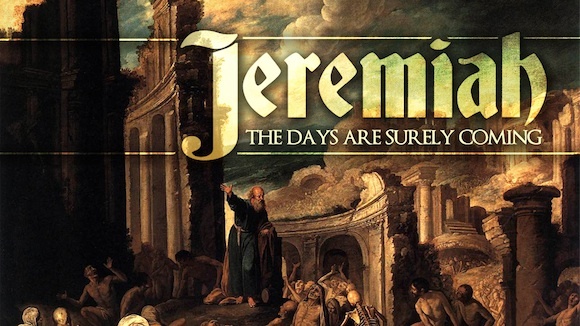 After that Jeremiah seeks the leaders for “surely they know the way of the Lord” (vs 5), but they too had turned away. The rest of the chapter deals with the impending destruction that will come from the north in the form of Babylon. Pictured as a lion and a wolf, the Babylonians will sweep in and destroy God’s sinful people. This result isn’t due to God being mean or unfair. The people had numerous warnings and pleadings to return to what they knew to be true, yet they ignored it. It wasn’t God who did this to them – it was their own choices. As we have seen repeated over and over throughout our reading of the Bible, it is sin which leads to trouble and calamity. Sin leads to heartache and destruction. Sin leads to poverty and sickness. In direct opposition to that – it is God who continues to extend mercy and grace to His wayward, rebellious, adulterous people. Three different times in the last two chapters God shows His true nature; “I will not destroy you completely” (vs 10, 18, 4:27). God longs to save His people, protect them, rescue them from danger, hold them in the palm of His hand and shelter them. But He knows they must choose for themselves – and they continue to choose sin. My friend, God loves you. He longs to save you, protect you, rescue you from danger. He longs to hold you in the palm of His hand and shelter you. But you must choose to repent and obey His ways. The prophet continues to point the way to a future Messiah in chapter 53 by telling us that He will sprout up “like a tender shoot” that has “taken root out of dry ground (vs 2). This is poetic language used to describe what has already been declared by Isaiah in other sections of his writings. The prophet has been sending this message to Israel for quite some time now. There will be a Savior born who will come and destroy the enemies of God, yet this Savior will not come the first time as a warrior – but as a “tender shoot”. Isaiah is telling them that the Messiah will come as a baby – born right out of the “dry ground” – which is Israel. It is language like this which probably played a hand in the Israelites missing the significance of this prophecy. The LAST thing they pictured themselves as is “dry ground”! Their religious eyes were lying to them and convincing them that they were honoring God by their works. They were deceived. The Messiah would not be coming as a Conquering King the first time around. He would not ride in like the cavalry and save them as they imagined. Instead He will come in the least expected manner and save them internally first. Next, the prophet calls Him a “Man of Sorrows” and “familiar with suffering” (vs 3). 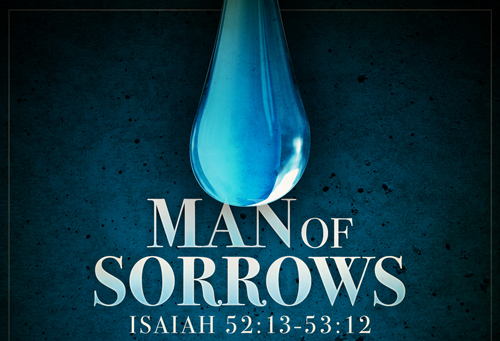 The reason Isaiah refers to the Messiah as a “man of Sorrows” is NOT because He possessed any sorrow – but because we did! This man would literally take our sorrows upon His own back and carried them (vs 4). He was familiar with suffering because He would literally take up (or bear) our sufferings (vs 4). Despite how obvious that the meaning of the original Hebrew for “sufferings” is “sicknesses” – there are unfortunately millions of ill-informed Christians who do not believe this refers to physical healing. This, despite the fact that Matthew quotes Isaiah in his gospel and inserts the Greek word nosos which means “sickness, disease” as proof that Jesus was the awaited Messiah as He went about healing all the sick (Matt 8:16-17). My friends, Jesus is the Messiah the prophet was speaking about. He was born as a baby (tender shoot) and grew up within the Israelite people (dry ground). He would take our sorrows, afflictions, sicknesses, grief, pain upon Himself when He went to the cross. Three days later He would rise from the dead – forever defeating death and all that He carried to the grave! You and I no longer are forced to be subjected to whatever happens in life. We are no longer under the curse of pain, affliction, anguish, disease, sickness, grief. You and I are free because of Jesus! Throughout the past few chapters, Isaiah has been speaking prophetically about the coming Messiah – who would rise to Israel’s aid and destroy her enemies at the end of the age. This was a glimpse into the future that most Jewish people throughout history have clung to in times of desperation. The hope that one day the Messiah will come and correct the injustices done to God’s people was constantly before them – spurring them on. Yet, what many (most) of the Israelites failed to understand was exactly “how” the Messiah would do these things. While most accurately interpreted Isaiahs prophecies as the Messiah coming in power and might – they missed the alternate description of this same Messiah coming as a suffering servant, as described in chapters 52-53. The end of Isaiah 52 and the whole of 53 could easily be described as the heart of the OT for Christians. While meant to offer hope and perspective for God’s people, it has instead been the source of controversy for generations. Somehow this vital imagery of the Messiah as a servant went unnoticed by the Jewish leaders throughout the inter-testimonial period (between Malachi and Matthew) and right up through Jesus day. There are a myriad of reasons for this – but the main one is the seemingly incompatible drawing of the Messiah as both conquering King and suffering Servant. The Messiah coming as a victorious executor of God’s wrath is understandable – but to be punished and suffer at the hands of men is a shocking insult to God Himself. 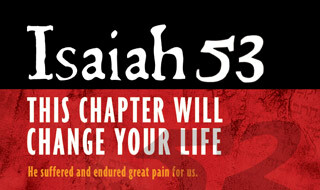 Ironically – it is this “shock” which Isaiah explicitly speaks of at the end of chapter 52. In vs 13 he presents the coming Messiah as one that “many were appalled at” due to His “appearance being so disfigured beyond that of any man”. In hindsight we can easily contribute this to the beatings inflicted upon Jesus as documented in the Gospels – yet for 1000 years people did not have the luxury of hindsight which we have today. The word appalled is the Hebrew word “shamem” and it means to be “numb with shock; or amazed”. Isaiah is prophetically seeing the act the Messiah being so abused that His outward appearance would no longer resemble that of a normal man (vs 14). He would suffer so brutally that even the most hardhearted men would shudder in shock at such mistreatment. He would become so disfigured by the treatment of His enemies that men would be stricken with amazement and shock at what they saw. Verse 15 then explains why this must happen: “so he will sprinkle many nations, and kings will shut their mouths because of him”. Sprinkle is the Hebrew “nazah” and it refers to the sprinkling of blood upon the altar for the cleansing of sin as described throughout Leviticus. The actual picture is the cultural act of a host sprinkling his guests with perfume water out of a silver sprinkler when they arrive for a feast at his home. The word is purposefully used because Isaiah is attributing this disfigurement of the Messiah as a powerful act. Many nations will be blessed with salvation due to the willing suffering of this coming Messiah/Servant. As well, Kings will stand in jaw-dropping amazement when they fully understand what has happened. Paul later quotes this very same passage in Romans 15:21 when speaking of his calling to share this good news to the entire world.